So with the gradual decline of professional level orchestras here in the states I have been thinking a lot about what I’m going to do with my life after I get my masters and possibly even my doctoral degrees. The main option seems to be trying to find one of the coveted jobs at a good college/university, teaching a studio, and forming an ensemble with some of my colleagues while hopefully being able to perform in a good symphony in the area. However, I find this option to leave too much to chance, just as the idea of auditioning for countless struggling orchestras and symphonies leaves me feeling anxious and out of control of my future. Being a music performance major by definition leaves the future open ended and uncertain: one doesn’t necessarily have the goal of teaching in mind, but one also can’t be completely confident in the possibility of landing a job desired by countless others. 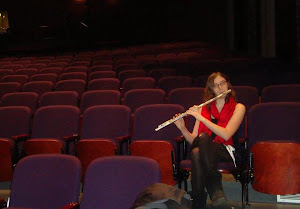 Especially as a flutist where the possible jobs in each orchestra are only two—unless if you are also quite proficient on the piccolo, in which case the job options are three—and even then one has to be in the right place at the right time to even get an audition, much less a callback and a job offer. So what does this mean? Did I simply pick the completely wrong field? Well, probably. But! I’m not in a place right now where I can just drop music and find a “real job,” like various well-meaning (and some not-so-well-meaning) people have advised. Instead I’m going to do what I think I need to do to secure a job in the future: I simply need to be the best player I can be in all aspects of the flute. That means working hard orchestral-ly (something that I’ve been trained to do for the last four years), as well as forming chamber ensembles, performing new music, different and strange music, and all sorts of genres which are suited for the flute—maybe even some that aren’t well suited for the flute. That means one thing for me right now: jazz. Not only is jazz a wonderful thing to listen to, but also it has such a rich history and so many possibilities for the future. Obe has a “highlights of the jazz story in USA” poster in our living room and it’s one of those things where so much has happened and is happening now that one can’t help but want to hop on the bandwagon and see what the big deal is. The groove, the swing, jamming, improvisation; these are all things that are embodied in the pursuit of jazz. Jazz is also slightly terrifying. Where does a flute fit in this world? Especially a flute that has been trained orchestrally—sure I can play most things put in front of me, but what will I do when I’m asked to play what’s inside of me, fitting it into what’s around me? Intense. It’s only fitting that I’m writing my thesis paper on improvisation and the effects on creativity and performance (both in and out of the musical world) improv has on students. If I didn’t explore improvisation more in depth then I would have absolutely no credibility on the subject.